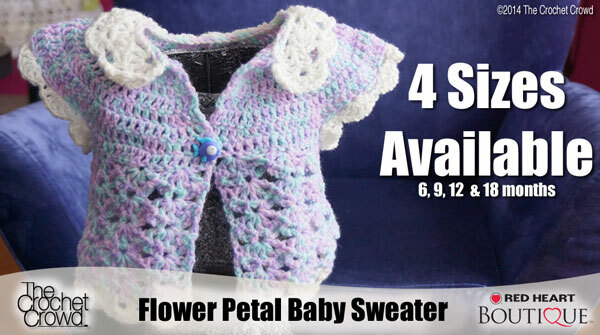 Baby Flower Petal Sweater Pattern. 6 Months – 18 months Sizes. This entry was posted in Baby & Kids, Red Heart Yarns, Tutorial Videos and tagged Baby, Cardigan, Crochet, crochet crowd, Easy, Free Pattern, Mikey, Pattern, Sweater, Tutorial. Bookmark the permalink. I have frogged this pattern 5X! I’m trying to make it for 24 month old baby. I’m very cautious of stitch count & when I get to the part for armholes, it’s just not working for me. I do not understand why. I’d appreciate your help, please. I need to finish dress by Easter. I’m going to try the visual tutorial one more time. The first one I did for 6 month old came out just like yours. Seems when I do increasing of pattern, it goes haywire. I love this swearter & headband my problem is that my grand daugther is 6 yr. old I would love to make this for her birthday in march can you help me. Thank you hook on crochet. I just made two of these sweaters. After I finished the last sweater which is for my grand daughter to be born in February. I went on The Crochet Crowd and there was a tutorial of Mikey crocheting the same flower petal baby sweater. I guess great minds think alike.